On the occasion of his daughter’s 15th birthday, the Not Yet Rev. Kevin DeBeck talks about the lessons he’s learned from her and how they apply to society as a whole. On this Sunday, our Religious Education program begins again for the church year. We will honor the children moving up to new classes with a bridging ceremony during the service. Because the chalice is the UU symbol of the sacred aspect of worship and because listening to one another is a sacred act of community, Chalice Circle is the name we use at Tree of Life for this circle format of adult programming. This type of program has been ongoing in our community since 2011. We use the Soul Matters curriculum for our circles and Soul Matters themes now also guide worship services and RE programming. Each month’s theme is our starting point for reflection, and then we gather to hear each other’s thoughts and questions. The silent listening is a dynamic which enables the speakers to find empowered voices. We often see that our own thoughts, questions, and journeys have much in common with our fellow human beings — and hearing the stories of others helps our own stories to appear with more clarity. We develop the skills of holding others in awareness and of becoming good listeners. In September our circles resume and will explore the theme of Vision. All circles meet once a month with a maximum of 10 persons in each circle, and a minimum of 6. On the back page is a list of the ongoing circles, but we are eager to start new ones as well. It’s possible to have a circle meet in someone’s home if there is enough interest in a general location – such as Woodstock. If you would like to hear how other people feel about this program, Sue Rekenthaler, Irene Raven, Marc Stettner, Sue McCowin, Leah Mikkelson, or Lisa Messinger would be happy to share their experiences. If you’re unsure if this is for you, you are welcome to attend and then decide if you would like to continue. If you have questions, comments, would like to sign up for a circle, or propose a different circle time, we would love to hear from you. Feel free to contact us or talk to us in church. [i] Irene Raven’s full quote: “ For me Chalice Circle is the most deeply spiritual practice available to us as UUs. Monthly engagement with a small group encourages me to love myself and to show love to others by engaging in the practice of deep listening. When I am heard without interruption or comment my sense of worth increases. When I listen to others, giving them my full attention without comment or judgment, I show my love for them as well. In addition, the monthly Soul Matters curriculum packets can act as my spiritual reading for the month, allowing me the opportunity to read and reflect and incorporate the theme and various suggestions throughout the month. I find it exciting and challenging to make this a part of my day. Just as the practice of meditation hones our skill so we can be mindful in our daily life, the practice of deep listening in Chalice Circle helps us to develop and use the skill of attentive listening. We are better able to give our family, friends and acquaintances the precious gift of our full attention in daily conversations. That is a precious gift to both the giver and the receiver. Family Movie Night Friday, March 23, 2018, 7:00 pm! Hosted by Green Sanctuary we will be showing WALL-E. Kid-friendly and serving snacks and refreshments. We will be watching on our brand new big screen television in the sanctuary! Wall-E, short for Waste Allocation Load Lifter Earth-class, is the last robot left on Earth. He spends his days tidying up the planet, one piece of garbage at a time. But during the 700 years Wall-E has developed a personality, and he’s more than a little lonely. Then he spots EVE, a sleek and shapely probe sent back to Earth on a scanning mission. 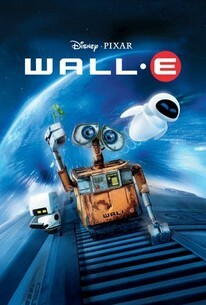 Smitten Wall-E embarks on his greatest adventure yet when he follows EVE across the galaxy. When we take care to find what has value for us, the realization also carries a natural gratitude. From our sense of abundance and its accompanying gratitude is a visible line connecting us to our generosity –with our time, our goodwill, our creativity, and our material goods. With that in mind, I’d like to offer a paraphrased excerpt from Kahlil Gibran’s poem on Giving. “…there are those who give and do not feel loss in their giving, nor do they seek fulfillment, nor are they thinking of their virtue; they give as blossoming trees breathe fragrance into space. Through the hands of such givers, the Divine speaks…… ….although some say, I will give, but only to the deserving, the trees in the orchard and the flocks in the field believe otherwise: they give so that they may live; for them to withhold is to perish. This month may we come together as a community in exploring the meaning of “abundance” – as we think about ways to experience it our lives and as we work to see it manifested around us. 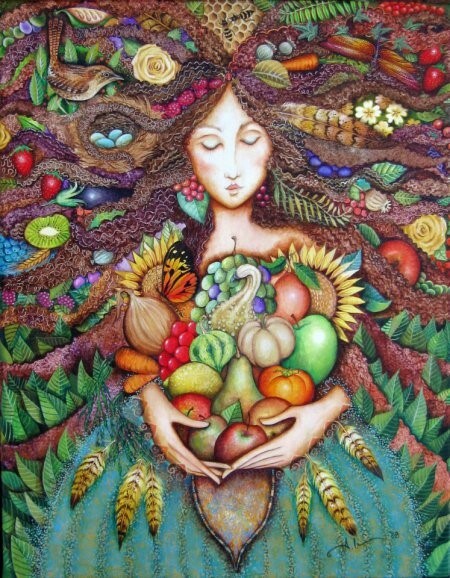 “Abundance” is the theme for our worship services. The resource packet can be accessed here. If you need a printed copy, please feel free to take a copy from those available in the fellowship room (or ask for a copy, if they have all been taken). You are also invited to join discussion through one of our Chalice Circles – you can find details about these circles here and there are also flyers next to the other packets. Within UU congregations, the “small group ministry” is a widely accepted format for adult programs. 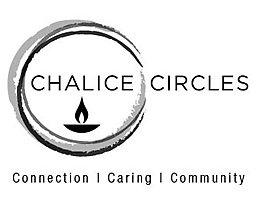 Sometimes the groups are known by the name of the curriculum being used, but often the name “chalice circle” is chosen because the chalice is the UU symbol of the sacred aspect of worship and also because listening to one another is a sacred act of community…..so Chalice Circle is the name we are using at Tree of Life. In one form or another, this type of program has been ongoing in our community since 2011 . Since 2014 we have been using the Soul Matters curriculum for our circles and in the past year we have expanded to 4 circles meeting every month. When we gather, we come to know the joys and challenges of each other’s lives and we hear the deeper thoughts and questions that we all share as human beings — the stories of others help make our own stories appear to us with more clarity. In September our circles resume and will explore the topic of Welcome. (click here for packet) All circles meet once a month with a maximum of 10 persons. Below is a list of the ongoing circles, but we are eager to start new ones as well. It’s possible to have a circle meet in someone’s home if there is enough interest in a general location – such as Woodstock. If you would like to hear how people feel about this program, Marc Stettner, Sue McCowin, Irene Raven, or Judy Stettner would be happy to share their experiences. If you’re unsure if this is for you, you are welcome to attend and then decide if you would like to continue. If you have questions, comments, would like to sign up for a circle, or propose a different circle time, we would love to hear from you, so feel free to use our contact information or talk to us in church. “Listening solidifies relationships and is a foundation for community. Listening with undivided attention and without interruption moves us beyond differences and shows deep respect; the speaker is valued. Paying attention and being paid attention create a community which embodies our UU principle of affirming and promoting the worth and dignity of each person …. 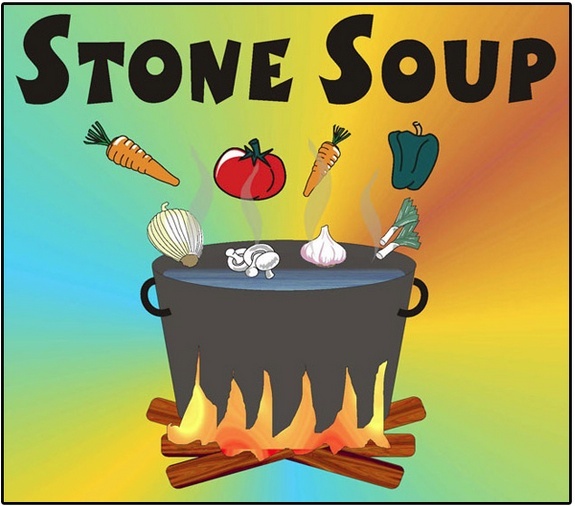 A Stone Soup Service. We all have something to share, no matter how small or seemingly insignificant. When we each come together in community to share our gifts, we find that something new and oftentimes wonderful is created as a result. Join us as we illustrate this in story and participation, sharing in a community soup, the result of what happens when we each bring something to the community. Everyone is invited to bring a little of their favorite soup vegetable already cut up for today’s service. We will also have a little pre-Service-Auction fun. Bring canned goods to church today and receive a coupon for $5 off on any purchase at the Service Auction to be held November 4. After the service, all the children are invited to go on a scavenger hunt to find the hidden canned goods. The kids will earn Service Auction coupons for cans they find. Last year, one very intrepid can hunter found a soup can that had been hiding on the church grounds for years. Besides earning coupons to use at the Service Auction, the canned goods will be donated to the McHenry Food Pantry. So this is a win-win for everybody. What was it like to live through the civil rights era? What was it like to witness prejudice and injustice? How far have we come from that time in history? Join The Religious Education Committee as we honor the Reverend Martin Luther King, Jr. and share stories from a book which tells of the Civil Rights experiences from people who lived through it. We will also all share in making a sand mandala together. There will be of songs by members of our committee, as well as congregational songs that will specifically add to the experience. What are some of your beliefs about how humans should act? What are some of your beliefs about the origins of the universe? What do you believe about how the universe functions? What are some of your beliefs about a higher power? What are some of your beliefs concerning life, death and the afterlife? What do you think is sacred? Which of these beliefs affect the way you act? How?